Elizabeth Warren just unleashed a new storm of insults on Trump and the Republican Party | Circa News - Learn. Think. Do. Sen. Elizabeth Warren (D-Mass.) ripped into House Speaker Paul Ryan on Friday for his upcoming campaign appearance with Donald Trump in Wisconsin, saying it proves racism and bigotry is now "officially part of the DNA" of Republicans. "Every ugly, racist, sexist, coarse, crude, hateful thing that Donald Trump has said is officially part of the DNA of the Republican Party," Warren said, calling the appearance "extreme Republican hug night." 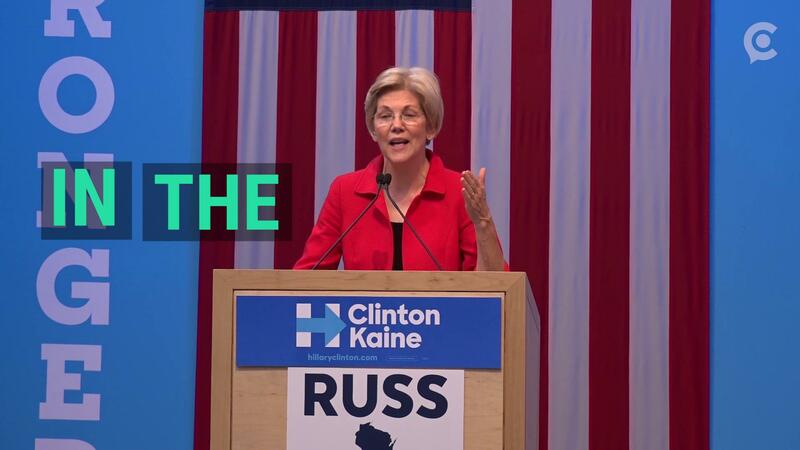 Warren made her remarks in Wisconsin at a campaign event for Hillary Clinton. Ryan, who is notoriously uncomfortable with his own endorsement of the Republican nominee, announced his first-ever campaign appearance with Trump on Thursday. Ryan's announcement did not actually say he would be campaigning for Trump, just that the two would be at the same event. Still, Warren took the news as an opportunity to slam Ryan and other Republicans as being complacent to Trump's controversial rhetoric. "They're just puppies on a leash sticking right there with Donald Trump," she said. Warren -- who has been trading harshly-worded barbs with Trump since her endorsement of Clinton in June -- also unleashed a couple new zingers for the Republican nominee on Friday. Citing his casino bankruptcies, she called Trump "a two-bit con-man who may be the worst businessman in the history of America." Citing Trump's 2007 comments that he was "excited" for the housing market crash, Warren called him "a small-insecure money grubber who cares about no one but himself." "[Donald Trump] may be the worst businessman in the history of America." Citing reports that Trump has underpaid or refused to pay contractors, Warren also called Trump "a pathetic, heartless bully." And finally, citing his recent comments that he was "smart" to avoid paying taxes, Warren called Trump "a selfish little sleazeball." 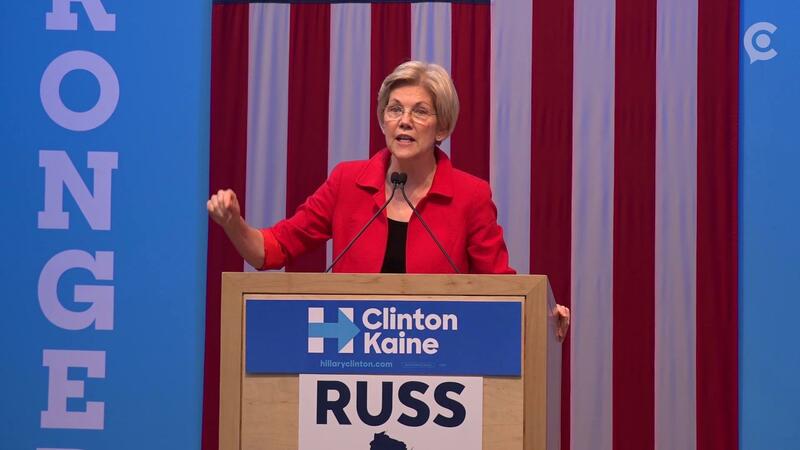 Name-calling is a historic staple of Warren and Trump's relationship. As Trump has made headline after headline with evocative verbal attacks against his opponents ("Low energy" Jeb Bush, "Little" Marco Rubio, and "Crooked" Hillary Clinton, to name a few), Warren has attempted to match him at his own game. In the past, Warren has called Trump "oh-so-fragile," "goofy," and a "loud, nasty, thin-skinned fraud," among other things. Trump, of course, has been known to hit back at Warren -- usually by calling her 'Pocahontas.' The insult is a jab at the fact that Warren has claimed Native American ancestry, a heritage which Trump appears to doubt. Trump's insult has been criticized as racist, and Trump did once say he regretted calling Warren that -- but only because it was an "insult to Pocahontas." "I do regret calling her Pocahontas because I think it's a tremendous insult to Pocahontas," Trump said. "So, to Pocahontas, I would like to apologize to you." Warren's tweet from the event was met online with a slew of counter-tweets from Trump fans.